In Africa, players from Nigeria, Kenya, United Republic of Tanzania, Algeria, Tunisia, Libya and South Africa, mostly reported receiving lower November Middle Eastern prices while some received rollovers initially, followed by downward adjustments as per the pricing service of ChemOrbis. In West Africa, a source at a major Saudi Arabian producer reported lowering their prices by $40-60/ton for PE and $40/ton for PP to Nigeria. 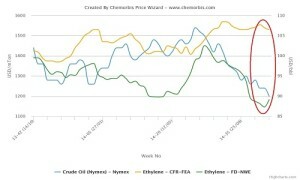 Another Middle Easter producer issued rollovers for PE at first, but then adjusted down their prices by $30/ton. However, players in the market report that irregular Korean origins are more competitive than import Middle Eastern offers, especially for PP block copolymer. Nigeria’s local producer ELEME kept their November PP prices steady from their October levels but cut their PE prices by NGN2000-3000/ton ($12-18/ton). ELEME was already expected to lower their prices given the competitive imports. However, players anticipate further decreases, of around NGN4000-5000/ton ($24-29/ton), as they do not feel satisfied with the decrease amounts announced. Plus, they believe that the producer will have to adjust down their PP prices as the month proceeds, like they did back in October, in order to remain competitive. Coming to the East, a trader offering both to Kenya and United Republic of Tanzania, noted that a major Saudi producer cut their LDPE and LLDPE film prices by $50/ton, HDPE prices by $20/ton and PP prices by $20-40/ton. However, the producer later issued further decreases of $10-20/ton on their HDPE and PP prices while maintaining their LDPE and LLDPE film prices at initial November levels. The trader pointed to the weak demand and comfortable supplies for the lower Middle Eastern prices. However, despite these decreases, buyers are anticipating further discounts on deals as they highlight unsupportive demand and restricted purchases. For PP, buyers underline the faded high season for raffia applications as well as the suspended restocking activities, which will not start until the end of March. In North Africa, Algerian players received decreases of $20-30/ton for PP, $30-40/ton for LDPE and LLDPE film and rollovers for HDPE film. Algerian players, too, voiced their expectations of seeing larger decreases for November when considering the global softening trend as well as the declining crude and naphtha costs. Tunisian buyers reported receiving €40/ton lower PE prices from a Saudi producer. However, meeting only their limited needs ahead of the approaching year end, many refrain from placing inquiries. Overall supplies are also reported to be sufficient inside the country while buying interest remain sluggish. 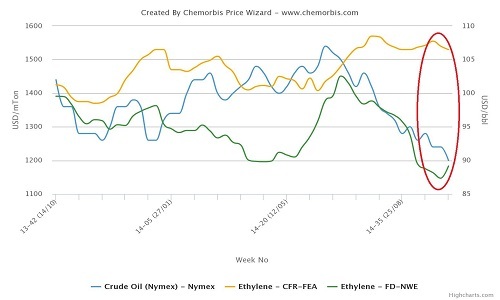 According to ChemOrbis, coming to the South, a trader operating in Cape Town, South Africa reported receiving new Middle Eastern PE prices with up to $30/ton decreases. According to him, a major Saudi producer holds no HDPE blow moulding availability while they hold very limited HDPE injection quotas. “Given the local producer Sasol’s ongoing maintenance, LDPE film supplies are a bit limited while demand is not too bad. However, the depreciation of the local currency affects our trade negatively,” he further added.